The genkan (vestibule) of a house built about 80 years ago. Old-fashioned genkan like this one are now very rare. Visitors would stand on the concrete floor (tataki, (1) ) and wait for someone living in the house to answer their call. They are then greeted from the inner vestibule (yoritsuki, (4) ), and invited to enter. They take off their shoes and leave them on the stone step (2). Next, they step up to the wooden step (shikidai, (3) ), then to the yoritsuki. The yoritsuki often has a decorative screen. 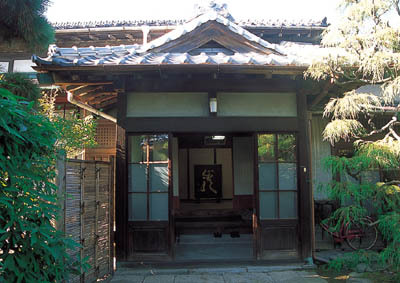 The vestibule just inside the main entrance to a Japanese home is called a genkan. Houses built in the traditional style have a somewhat formal genkan, and you are expected to follow a certain etiquette when entering. First, you stand outside and call out a formal greeting to announce your presence, then you slide open the outside door and walk onto the concrete floor (tataki) that is at ground level. Someone living in the house will come to the small open room facing the tataki to greet you. If the person invites you inside, remove your shoes, then step up onto the wooden step (shikidai). Now you can walk into the house, to the room reserved for visitors. The genkan is located on the psychological boundary between the inside of the home and the outside world. It is also an essential part of any Japanese home, because Japanese don't wear shoes in the house and thus need a space to take them off. Apartments and condominiums are bound to have a genkan, generally with a more simplified design. The word genkan was originally used for the entrance to a Zen temple. The word is written with two ideograms, meaning "gateway to profound knowledge." This implied that someone who passed through the gateway was beginning a life of strenuous Zen training. The temple's genkan had much significance to the traineesit was their first step into the life of Zen. Around the 17th century, samurai began building vestibules at the entry to their houses, complete with the shikidai step. They called their vestibules genkan, after the Zen temple gateway. Before long, rich merchants were building them too, and the custom soon spread to the common folk. Even today, the genkan might be considered the most prestigious part of the house, a place above the humdrum of everyday life. The genkan is an interface between the inside of the home and the outside world. It presents an image of the home to visitors. That is why you'll often see some decoration there, perhaps flowers or an ornament. The genkan is a place of tradition. People coming home from a funeral will not enter it until they have sprinkled salt on themselves outside the home, in an old ritual of purification. There are certain customs to follow when using this important place. For example, before entering someone's genkan, you might be expected to take off your coat and hat, and to make sure your clothing is in order. Once inside the genkan you must remove your shoes. It is best to arrange them with the toes facing the door, and to place them at ground level near the step, a little to the side (not in the center). Doing this will show respect for genkan etiquette.